Unable to Deliver Emails to Hotmail, Live, MSN and Outlook? Outlook.com is putting my legitimate emails into its junk mail folder. What do I do now? The Microsoft properties (Hotmail, Outlook, MSN. and Live.com) are obeying Yahoo and AOL’s DMARC p=reject. That means that whenever an email from someone with a yahoo.com or aol.com address comes for someone with a hotmail.com, outlook.com, msn.com, or live.com account, if that email “from” yahoo.com or aol.com isn’t actually sent from a Yahoo or AOL mail server, then it is being rejected (bounced). So, if you’re sending emails from your yahoo.com or aol.com email address, but not using the Yahoo or AOL mail server, change your “From” domain to prevent message rejection by the Microsoft properties. I’ve created the following checklist and tips that any marketer or person sending email can follow to help them get delivered to the Inbox. 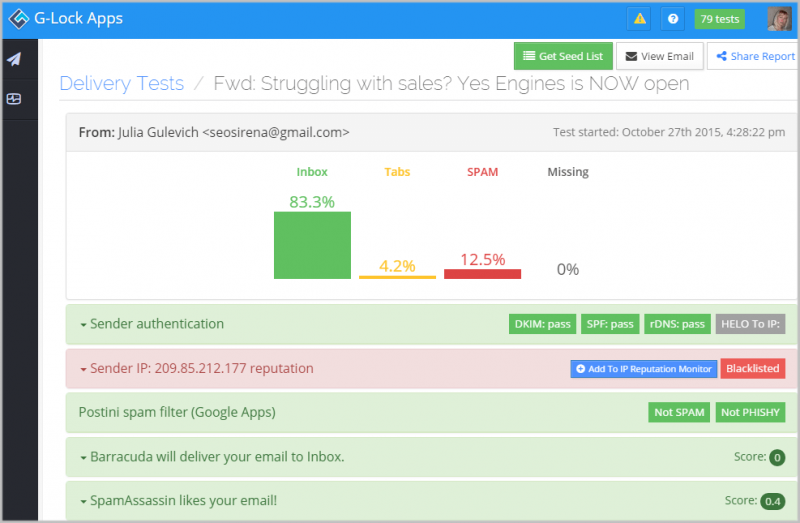 So you can optimize your email delivery system and deliver your emails into the Inbox instead of the Junk email folder. Use G-Lock Apps to discover if you have a deliverability problem and how to fix the problem as quickly and easily as possible to improve your deliverability, and get the maximum conversion rate when you send out an email promotion. 1. Set up SPF and Reverse DNS Records to Authenticate You as a Legitimate Sender. If you don’t have the SPF and reverse DNS records properly setup, it doesn’t always mean that your email is deleted or moved to the Junk folder. But it can affect how Hotmail rates your email and how it will treat your subsequent messages. And furthermore, depending on the user’s settings and the reason why the email was not authenticated, the message may be labeled as “unknown sender” in the Inbox that is not good for your brand recognition. Therefore, it’s highly recommended that you setup your SPF and reverse DNS records if you don’t have them yet before you send your email newsletter to your Hotmail subscribers. In this article you can read more about the sender authentication and how to get your emails delivered. 2. Ensure the Links in Your Email Aren’t Blacklisted or Inactive. Check to see if any of your URLs are on URL/domain-based blacklists like URIBL and SURBL. If listed, work to get removed from the blacklist or change the link in your content. On a similar note, ensure all URLs within your content are active and resolve to the proper place. This includes 3rd party URLs, too, like bit.ly and other URL shorteners, and even advertisers. 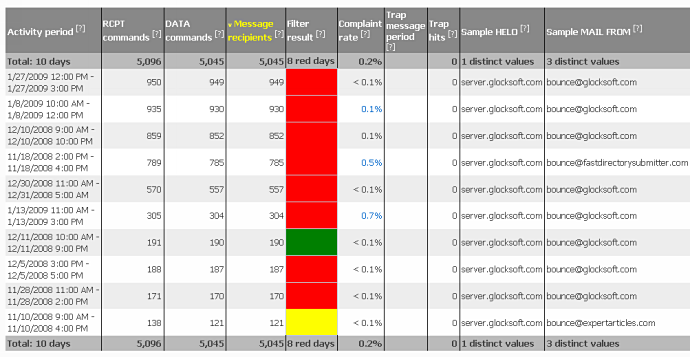 Check your SpamAssassin report on GlockApps for possible blacklisted and/or inactive URLs/domains. 3. Stop Sending to Bad Email Addresses. If an email returns as a hard bounced, you need to delete it from the list immediately. If an email returns as a soft bounced, you can try several attempts to deliver it. If after a few attempts, the email still bounces, remove it from your list too. If you continue sending to non-deliverable email addresses, your activity may be considered as spamming. 4. Sign up for Microsoft’s Smart Network Data Services (SNDS). 5. Follow Best Email Marketing Practices. A Outlook account expires if it is not used during six months. After the six month period an email sent to a dead account bounces with the “550 Requested action not taken: mailbox unavailable” error. After one year of disuse, they start using that mailbox as a spam trap. If a high volume of your email lands in spam traps, your IP address could be blocked. Send only to recipients who explicitly subscribed to your emails (no purchased, rented or scraped list). Send an unsubscribe link, so that the recipient can unsubscribe immediately. Use consistent sending IP addresses and domains for your email campaigns. Use a consistent From name and From email address to clearly identify your brand. Track the temporary and permanent SMTP errors from your mail server and act on them accordingly. Have a working process of handling bouncing addresses. Don’t reactivate email addresses that are already on your unsubscribe or suppression list. Firstly, take a closer look at your email collection process. If you are collecting subscribers on your website, you’ll want to use a confirmed subscription process. It is the best way to avoid malicious subscriptions, mistyped email addresses and surely spam trap emails. Secondly, it’s now more important than ever to deal with your bounces as soon as possible and maintain a clean mailing list. If a message consistently bounces, remove that email address from your list. If you continue emailing to bad addresses, your IP will end by being blacklisted, and your emails will not be delivered to subscribers. It was just a bad email marketing “etiquette” to send to non-existent emails, but as you see it’s self-destructive now. Cleaning a list from bounced emails is a time consuming and tedious work. Better if you could collect bounces and delete them from your contact database at one go. EasyMail7 has a built-in system to automatically process bounced emails: collect bounces from your email account and delete them from your contact groups. 6. Check Your Brightmail IP Reputation. Outlook uses the Brightmail anti-spam content filter. The Brightmail technology learns what email is spam from all mail received in their spam trap network. If a high volume of your mail is considered suspicious, your IP address could be blocked or bulked. You can check your Brightmail IP reputation and request block removal here. 7. Send Emails from IPs with a Positive Reputation. Outlook looks at your sender reputation. No reputation does not mean a good reputation. As a result, mail sent from new IPs is usually filtered into the bulk folder until a positive reputation is observed. You can regularly check your IP reputation and the various factors causing any decline via senderscore.org. Return Path research has shown that the higher your Sender Score, the better your chances of reaching the Inbox. 8. Keep Your Subscribers Engaged. Make sure you keep your subscribers engaged by setting the proper expectations up front regarding the type and frequency of emails they will receive from you. Deliver on what you promised, what is relevant to them and what they can easily recognize is coming from you. 9. Get Certified with the Return Path Whitelist. By having a third party like Return Path accredit your sending practices, Microsoft can deliver your email to the Inbox at Hotmail and Outlook, and with images enabled. Acceptance into the Return Path Certified whitelist will positively impact delivery. don’t send spammy looking emails. Following these basic rules is a must for any responsible email marketer. At Gmail, you’ll see whether your email lands in the Primary, Promotions, Social tab in the Inbox or in the Spam folder. …and provides feedback for common ISP and corporate filters. Read through your report and note what score you received for each spam filter. If a spam filter did not pass we’ll explain what’s causing the issue. If you need help with troubleshooting information for senders who are having trouble reaching Outlook.com users by email, check out this resource. I did setup a test account with my Hotmail to make sure that I wasn’t having issues because of any spam words, so that was very helpful. Some of my stuff did go into the junk folder, so it was good that I caught it!